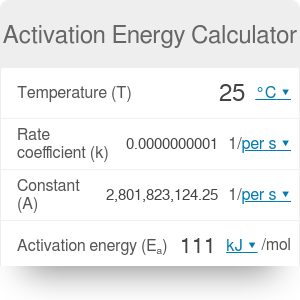 This activation energy calculator (also called the Arrhenius equation calculator) can help you calculate the minimum energy required for a chemical reaction to happen. For example, you may want to know what is the energy needed to light a match. This article will provide you with the most important information - that is how to calculate the activation energy using the Arrhenius equation, as well as what is the definition and units of activation energy. Make sure to take a look at the kinetic energy and potential energy calculators, too! Activation energy is the energy required for a chemical reaction to occur. You can picture it as a threshold energy level; if you don't supply this amount of energy, the reaction will not take place. Activation energy is required for many types of reactions, for example for combustion. Every time you want to light a match, you need to supply energy (in this example in the form of rubbing the match against the matchbox). That's why your matches don't combust spontaneously. This is the same principle that was valid in the times of stone age - flint and steel were used to produce friction and hence sparks. R stands for the gas constant. It is equal to 8.314 J/(K*mol). T is the temperature of the surroundings, expressed in Kelvins. k is the reaction rate coefficient. It is measured in 1/sec and dependent on temperature. A is the pre-exponential factor (also called the frequency factor), also expressed in 1/sec. This coefficient does not vary with temperature and is constant for a reaction. Eₐ is the activation energy of the reaction. Begin with measuring the temperature of the surroundings. We can assume you're at room temperature (25°C). Then, choose your reaction and write down the frequency factor. For example, for reaction 2ClNO → 2Cl + 2NO, the frequency factor is equal to A = 9.4*10⁹ 1/sec. Choose the reaction rate coefficient for the given reaction and temperature. Let's assume it is equal to 2.8373*10⁻⁸ 1/sec. Input all these values to our activation energy calculator. It will find the activation energy - in this case, equal to 100 kJ/mol. Activation Energy Calculator can be embedded on your website to enrich the content you wrote and make it easier for your visitors to understand your message.